Kurt Huggins and Zelda Devon, collectively known as Teetering Bulb, are a an illustrator team living in Brooklyn. Their clients include Realms of Fantasy, Dover Publishing, Wizards of the Coast, Honest Tea and Tor.com. 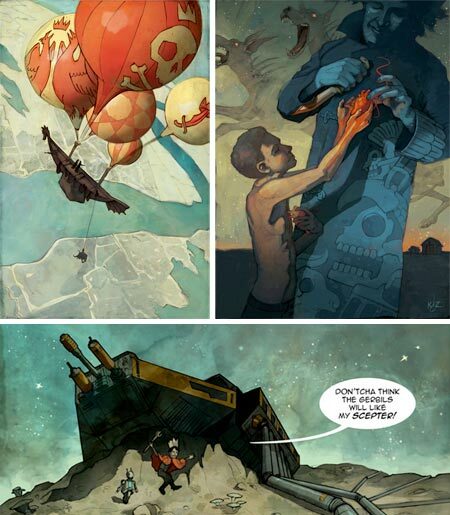 They are also creators of webcomics; and Tor.com, home of Tor publishing (se my post on Tor.com) is hosting their short story webcomic, The Dreaded Question, as well as a new fantasy story King of an Endless Sky (image above, bottom), which has just started. Their comics approach has a nice painted feeling, while still working within the traditional comics framework of color filled line drawings. Their illustration is more painterly, but still has a graphic, linear quality that gives it a particular visual charm. Their blog features many of their works in various stages of creation, in addition to sketches, studies, anatomy drawings, and finished illustrations. Their portfolio is basically a subset of blog posts, as are listings in the right hand column for sketchbooks and prints. Though it’s been commonly accepted in Europe and Japan for may years, it’s finally creeping into common knowledge here in the U.S. that the medium of comics, or “graphic stories”, is not limited to — a: an audience of kids, and b: stories about steroid disasters in leotards grimacing and punching each other. Comics is simply a medium, one that can be used to convey or talk about essentially anything, including reportage. 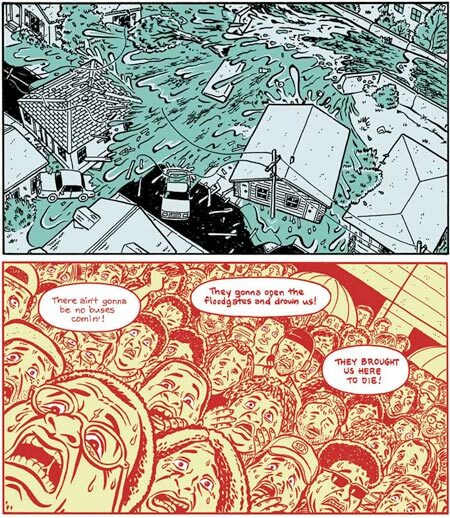 A.D. New Orleans After the Deluge is a graphic story about the disaster (both natural and political) of Hurricane Katrina and its aftermath. The story is published by Smith Magazine and written and drawn by Josh Neufeld, a member of the ACT-I-VATE comics collective and author of The Vagabonds, with consulting and editing from Jeff Newlet and Miles VanMeter. A.D. was initially published as a webcomic, which you can still read online at Smith Magazine, and has now been released in book format. There is a video interview on the making of the story on YouTube. It’s not that often that I get excited about the the occasion of a single painting crossing the Atlantic Ocean, except for those occasions when it happens to be one of the finest paintings by one of history’s finest painters, and particularly if that painter is Johannes Vermeer. Celebrating the 400th anniversary of the historic voyage of Henry Hudson (as in name of the river) from Amsterdam to New York (as in New Amsterdam), Vermeer’s The Milkmaid (De melkmeid, high resolution image here) will be on loan from Rijksmuseum in Amsterdam to the Metropolitan Museum of Art in New York from September 10 to November 29, 2009. Historically, Vermeer’s works have not travelled often, though that seems to be happening more frequently these days, and The Milkmaid has not been on this side of the Atlantic since it was exhibited at the 1939 World’s Fair. The painting, one of only 35 (give or take an attribution) by the enigmatic Dutch artist, is widely acknowledged to be one of his finest, and will be displayed in the company of the Met’s own astonishing collection of 5 Vermeers, including another pinnacle of his work (and my personal favorite), Young Woman with a Water Pitcher.. 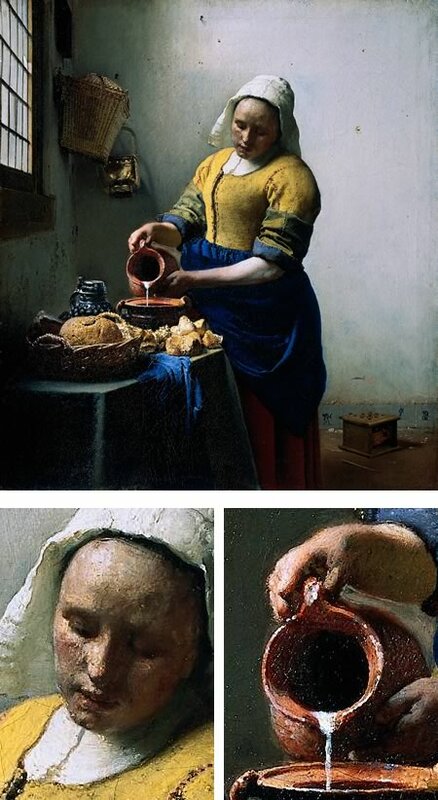 In both of these works, the humble subject of a woman pouring, or about to pour, liquid from one vessel to another is imbued with Vermeer’s almost magical command of light, pouring in through the vessel of a leaded glass window and drenching his physical objects in its liquid warmth. The Girl With a Pearl Earring gets the glory because it has become a cultural icon, but it is in Vermeer’s more complete works like these that we see the master’s extraordinary abilities to best advantage. The Met is also surrounding the Vermeers with works by Pieter de Hooch, Nicolaes Maes and other Vermeer contemporaries (see my post on Pieter de Hooch). In addition, if you can make it to the exhibition, you are only a short distance from three more of Vermeer’s extraordinary paintings at the Frick Collection. Wow. For more on Vermeer we can turn, as always, to Jonathan Janson’s amazing web resource, Essential Vermeer (and his related blog, Flying Fox). So if you are in New York this Fall, and are inclined to experience the magic of light from the 17th Century, captured, distilled and bottled by Vermeer’s genius and released in your presence like a mist of poetry scented photons, here is your chance. Though she had been given art lessons at home as a child, and followed a desire to be an artist into studies at the Art Institute of Chicago and The Art Student’s League in New York, where she studied with William Merritt Chase (see my post on William Merritt Chase), Georgia O’Keeffe stopped making art soon afterwards, frustrated with her work and direction in pursuing realistic painting. Four years later she encountered the artistic philosophy of Arthur Wesley Dow while taking a summer course for teachers at the University of Virginia, whose novel ideas insisted that the artist should create based on elements of color and line and the artist’s own inclinations rather than emulating nature. Freed from the constraints she felt in her academic training, she began to reinvestigate the possibilities of art. A couple of years after that she produced a series of charcoal drawings that a friend of hers brought to the attention of renowned photographer and gallery owner Alfred Steiglitz, and the drawings were exhibited in Steiglitz’s New York gallery without O’Keeffe’s knowledge. Steiglitz proceeded to convince O’Keeffe to move to New York and pursue painting full time. Steiglitz and O’Keeffe married several years later and were one of the most celebrated artistic collaborations of the 20th Century. 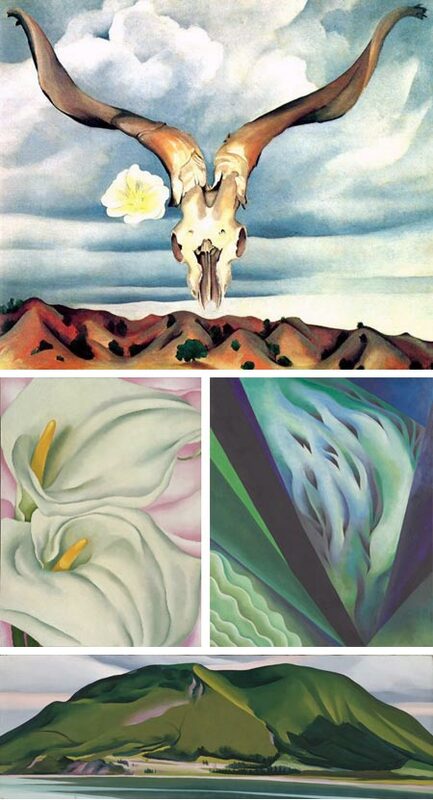 Steiglitz produced a remarkable body of portraits of O’Keeffe over the course of their life together and was an indefatigable supporter and promoter of her work. O’Keef begain spending her summers in New Mexico, producing works inspired by the desert landscape and the light and color of the southwest, along with still lifes and other subjects that reached across the boundaries of representational and nonrepresentational art. O’Keeffe received both popular and critical acclaim in her lifetime and remains one of the major figures of 20th Century American art. If you get a chance to see her work in person, you will see how her approach and her use of scale can do one of the things art does best, encourage you to stop and look at things with fresh eyes. There is an extensive list of museums with her work in their collections on Artcyclopedia. One of animated films that I discovered through Irene Gallo’s Saturday Morning Cartoons listing (see my previous post) delighted me in particular, Kunstbar, by Steve Whitehouse and a group of associates that call themselves The Petrie Lounge. The group includes Denis Gonzalez, John Halfpenny, Chris Labonte and Paul Teglas. “Kunst” is the word for “art” in German, Dutch, Norwegian, Danish and Estonain. The Kunstbar we encounter is apparently on a side street off one of Giorgio DeChirico’s perspective defying plazas, and is frequented by artistes whose taste in drinks is, um… interesting. The menu consists of drinks named after artists, a common enough practice, but here the Petrie Lounge crew has taken that idea literally and the drinks are in the spirit of the artist in more than name. Our intrepid protagonist, apparently a dedicated art lover, tries several, much to his detriment and our amusement. This stylish animated short is a delight for lovers of art and animation alike, so stop by the Kunstbar for a short one. Oh, and don’t order the Bosch. In addition to her own terrific blog, The Art Department (required reading for anyone interested in science fiction and fantasy illustration), her contributions to the Tor.com blog, and of course her ongoing work in bringing the best and brightest lights in the field to print in her role as art director at Tor Books, Irene Gallo (see my posts about Irene Gallo and Tor Books) brings her sharp eye to bear in another way we benefit from. Each Saturday she makes another astute selection of two short animated films worthy of our attention and posts them to her Saturday Morning Cartoon Index on the Tor site. These shorts are from a variety of creators and sources (though many are sponsored by the national Film Board of Canada), and traverse the spectrum of subject matter, style, emotional tone, animation technique and cinematic direction. They share one characteristic, they are all terrific examples of short form animation, and a treat to watch. Gallo keeps the stew well stirred, mixing style and approaches from week to week and selection to selection. Sometimes the two choices for a given week share some common theme or characteristic, as in her matchup of Pyrats and The Tale of How (see my posts on The Tale of How). There are many weeks of selections already posted, enough to keep you animated and amused for a number of weekdays, as well as looking forward to future Saturday mornings.